This annual competition allows middle and high school teams to compete for recognition and scholarships by demonstrating their knowledge of environmental science and natural resource management. 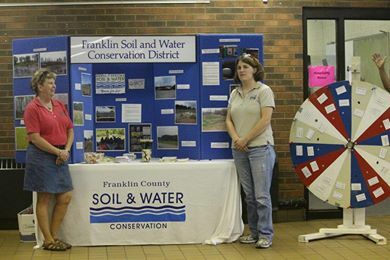 Franklin County teams compete against teams from schools in eleven Soil & Water districts (Area IV). If they are successful at the Area level, they go on to compete at the State Envirothon. The winning high school team at state level will progress to the National Envirothon. The District sponsors one or two students each year to attend the Resource Conservation Workshop at NCSU campus in Raleigh. The workshop is open to 9th, 10th, & 11th grade students. High School Seniors are not eligible to apply. The five day residential workshop involves hands on activities and study areas related to natural resources and environmental subjects. Awards and scholarships can be won by any of the 100+ students displaying, among other categories, high academic achievement. To get a better idea of the workshop, please take a look at this video, produced by Durham Soil & Water Conservation District. For over 30 years Franklin Soil & Water Conservation District has participated in the North Carolina Association of Soil & Water Districts conservation contest. The contest theme (excluding the Bookmark Contest) is determined by the North Carolina Association.Theme will always focus on agricultural, urban and local conservation subjects and rotate each year. Information is sent to each school early in the fall. The poster contest is open to 3rd, 4th and 5th grade students. The essay and power-point contests are open to 6th grade. POSTER, ESSAY, POWER POINT & COMPUTER: Prizes are awarded to 1st, 2nd, and 3rd place grade winners in each school. All 1st place school winners compete against each other for an overall County prize. County winners are submitted to the Area IV contest and compete against 10 surrounding counties. Area IV 1st place winners are submitted to the State contest in Raleigh and compete with students from 96 Soil & Water districts in North Carolina. BOOKMARK: One winner will be announced for Kindergarten, First & Second grade countywide. Each student will receive $25 and their bookmark will be reproduced for the winners class. Winning bookmarks will also be placed at the Franklin County Library and used for Soil & Water events. The 2018-19 BOOKMARK contest theme is "Birds,Bees and Butterflies". The 2018-19 contest theme for ALL OTHER CONTESTS is -"The Living Soil". District staff are available to visit schools in order to present lessons and demonstrations to the students. We have three hands-on Enviroscape models which we can use for point/non-point source pollution, wetlands and coastal lessons. In the past, we have also presented lessons on water quality, watersheds, macroinvertebrates, forestry, wildlife, and others. The district also has an information booth featuring displays on who we are and what we do, as well as plenty of information on programs we offer. Finally, there is the ever-popular Wheel of Conservation, as featured annually at the State Fair, which always provides a great attraction at environmental education events. The District has a wealth of information and activities at its fingertips. Many of these activities can be adapted to each classroom situation and grade level. We also have a large selection of conservation and environmental media available for loans. If you have specific needs, please contact us and we will try to accommodate them. If you have any questions or need anymore information, please contact Charlie Bass, Education Coordinator. Municipal Website powered by YourTown CMS. Design by LDG, Development by NMC.